Must have tried nearly every formation now with Hull City, it starts off good then we get into a losing streak, maybe the other teams are good at working teams out on FM15. I just can't seem to get the formation thing spot on, I've had some success with adapting my formation to suit my players preferred role, e.g. adding shadow striker to the formation to accommodate Eran Zahavi. I have also just set the team mentality to control, we'll see how this turns out, at the moment we are part of a relegation zone battle and I am much worse off than I was in my last Hull City save, 3 points is all that separates the relegation battle from mid-table. The table's a bit of a strange one this time round, how are Liverpool so good, doesn't really represent real life. Liverpool are no where near as strong as Man Utd, Chelsea and Man City in real life, another thing is that Balotelli is way overpowered on the game. He has the stats of a top class striker, this is a long way from reality as he has rarely scored during his time in the Premier League, I don't get how he could have been rated so highly on FM15. Well at least we have something to smile about with Eran Zahavi being one of the top scorers in the Premier League, I mentioned earlier that he cost just £2.1m from the Israeli league, that's got to be a bargain for any team struggling to get the goals. There's no real surprises apart from Andros Townsend who has a high number of goals for a midfielder, I personally don't rate him that highly in real life, and he doesn't have that sort of consistency. Surely Harry Kane should be on this table somewhere if Andros Townsend is. Eran Zahavi is the man of the moment, we may struggle to hold onto him if he continues to carry us like this, our defence is still very leaky but we have put together a good string of results which makes it very likely that we'll be in the Premier League next season. An important thing to add is that he has really started 26 games overall this season and 11 as a substitute, I didn't really play him at the start of the season as he took a while to get going, I can't say enough how much he has saved our team this season. Okay so that's the first season completed, I though I would just show how the top goalscorers stats looked at the end of the season, and as you can see Zahavi finished the season on 22 goals in 2nd place, not bad for £2.1m. If the rest of our team was as strong we would be a good team, we ended up finishing in 13th place, now to improve on that for next season. Hopefully we can make a couple of good signings again from the 3 star rated divisions. I've managed to make quite a few profitable transfer dealings, one of the more interesting was the purchase of Kevin Kampl for £4.3m and his sale for £17.25m to Man City a season later, this enabled us to strengthen our squad more widely. I offloaded the core of the team in the first season to freshen things up so that I could make a number of signings, also most of those that I have bought in the first season have now been sold on for a profit apart from Eran Zahavi who is still at the club. This is a screenshot of my second season transfer dealings after the summer transfer window, again I have purchased players from lesser reputation clubs for decent fees, which allows me to make a profit when selling them on so that I can add more players to the squad. What a result, we're definitely better than last season, we recently beat Arsenal 3-2 and drew 2-2 with Man Utd. After quite a poor start to the season we are now up to 11th, there's only 9 points between 11th and 5th at this stage. Time for another player screenshot now, Pajtim Kasami was signed from Olympiakos for £5.75m in the summer, his physicals look pretty good. Hull City are now up to 8th place, in transfer developments Abel Hernandez is sold to Inter for £9.75m and Eran Zahavi is sold to Benfica for £8.5m, that's a realised profit of £6.4m which has been invested in new players. The most expensive signing of the January transfer window for Hull was Stefanos Athanasiadis for a fee of £4.2m from PAOK, our fortunes in the league have turned with many players making contributions to the teams performance, our large squad size has given us the edge over our opponents due to our fitness levels over other teams. I have been able to expand the squad because of the extra money made available through the profits made from buying and selling players from some of Europe's more average leagues. From our results here, we conceded late on against Southampton to prevent us from winning, and we were also down to 10 men against Cardiff when the game started to change in their favour. We made a terrible start to the season and were bottom of the league but have since recovered remarkably to 8th position, one of my proudest results as manager of Hull was the 2-0 victory over Chelsea, this is something I had never thought possible against such a physically, mentally and technically strong side. Another fantastic result against one of the bigger teams, Snodgrass has been on fire this season, nice to see Kasami and Athanasiadis, both signings from the Greek league, getting their names on the scoresheet. We finished the season in 9th and improvement of 4 places on last year, I'm happy with this as we progressed as a team, and this should give us the opportunity to sell some of our players for high fees as some of them had really good seasons. I'm afraid that I was sacked as Hull City manager, then offered the opportunity to manage Southampton which I accepted, Southampton were in 17th place when I took over. I'm in my third season now and I will start by uploading a screenshot of my first signing Mario Gavranovic from PAOK, he cost just £375k and is already valued at £4.8m. Here's a screenshot of my Southampton team chosen to face Man City away in the 2016/17 season (3rd Season), when I joined Loic Remy, Santi Cazorla, Alireza Jahanbakhsh, Fabio Coentrao, Curtis Davies and James Chester had all been signed by the previous manager/s. I have decided to go with a 4-2-3-1 narrow. 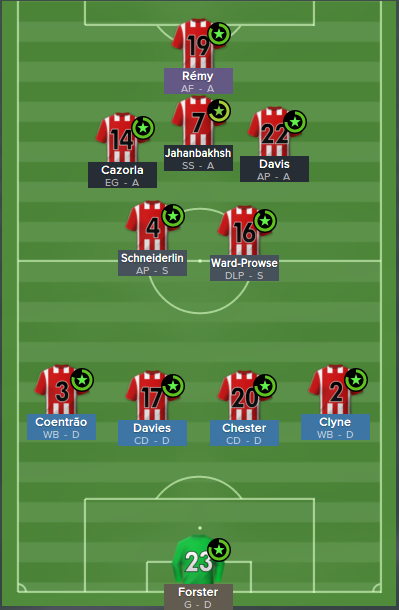 I was at Southampton for a very short period and didn't have the time to turn them around, they had too many big wage declining players, e.g. Santi Cazorla. I was offered the Fulham job which I accepted, I have now managed Hull City, Southampton and Fulham. I have started my Fulham managerial career, hopefully this one can be the successful one, the expectation is to avoid relegation as Fulham have just been promoted from the championship. I will start by introducing my two new signings, Tomas Necid for £3.9m from Viktoria Plzen and Sylvester Igboun for £4m from FC Midtjylland, these are fairly cheap signings for us. 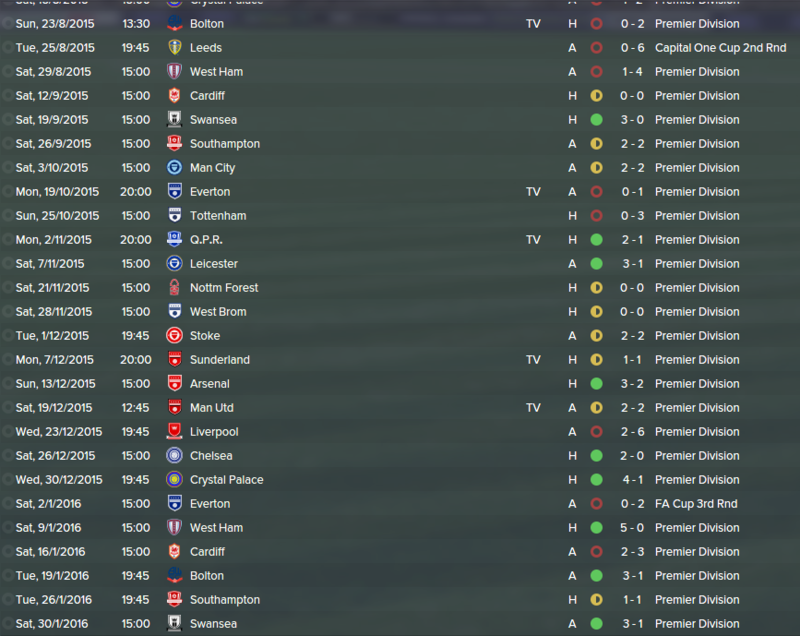 I am determined to get Hull City half-right at some stage, so I am making a third attempt with them. Eran Zahavi is there again just because he's a quality player, Mauro Boselli is another signing who scored 21 goals in the Mexican league last season with Leon, and Jesus Eduardo Zavala also from the Mexican league. Bruno also looks a quality signing from Villarreal, the plus is that they all look fairly cheap fr what they can achieve.